Young Professionals | Williamson, Inc.
Our Young Professionals is tailored for ambitious individuals who are interested in furthering their leadership aspirations, cultivate relationships and grow professionally. The educational luncheons allow our young professionals the opportunity to network, connect and learn from some of the most experienced and influential business leaders in Williamson County. Williamson, Inc. Young Professionals is tailored for the unique interests of our 40-and-younger members. This group is the ideal vehicle for ambitious young professionals who want to nurture their leadership aspirations, cultivate relationships with experienced industry professionals, share common interests and advance their developing careers. 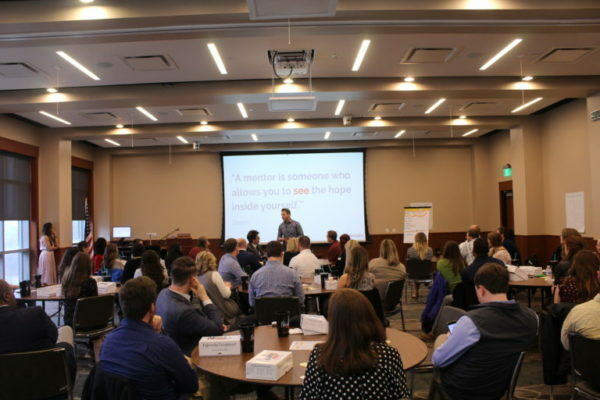 Be sure to check out all of the Young Professional Leadership Development Programs that Williamson County has to offer, here. To register for the latest YP Luncheon or Mixer, head to our 2019 Events Calendar! The YP Leadership Team is tasked with directing the young professional’s vision and mission, by working with all other YP leaders and YP Ambassadors to guide programming and create an engaging environment at YP functions. The Leadership Team will coordinate with a Williamson, Inc. team liaison to ensure consistency with the organization’s policies and other events. Applications to join the Leadership Team are usually accepted in late Fall.